Affirmation: I am aligned, in harmony and whole. I am in the vortex. The vortex and I are one. 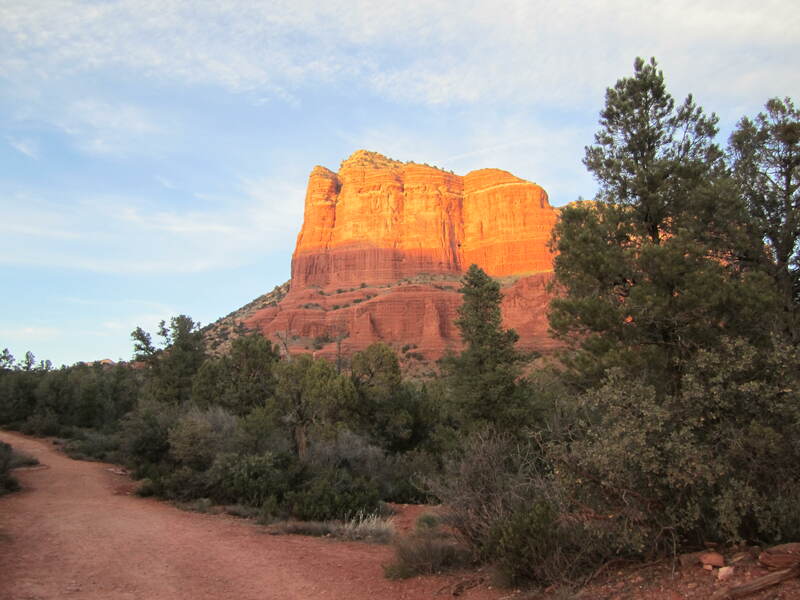 Sedona, Arizona, is a mecca of vortexes, and it’s the next place our journey led us. What a beautiful, breathtaking and magical place. I’m so happy I’ve been able to experience it. We drove in through Flagstaff, AZ. Having never been to Arizona before, I didn’t realize that we would drive through a huge forest to get here. I guess I had it in my head that Arizona was just desert. At Flagstaff you are at 7000 ft and then you drive down a windy two lane highway about 28 miles to Sedona. At first it seemed like the forest went on forever, so I couldn’t figure out when the giant red rocks Sedona is know for would appear. When they did, it was so breathtaking my eyes welled up with tears. I was overcome with its beauty and I could feel the energy and love Mother Earth has. Since we’ve been here I’ve made a point to hike to each of the vortexes and do a meditation to engage myself further with the energy here. It’s been magical. I could actually feel the energy. To me it feels like flowing waves and I feel lighter, like I’m floating. Everyone experiences it differently though. What is a Sedona vortex? The vortexes are sites where there is a spiral flow of spiritual energy existing on multiple dimensions. It is believed that you can tap deeper into your inner self through prayer and meditation when you access the vortex energy. Even if you come here and don’t have the heightened sensitivity to actually feel the energy, you can’t help but notice it in the people, the environment and just the general sense of peace that comes over you from being here. Abraham Hicks speaks of the vortex. Abraham tells us that the vortex is, “where the Law of Attraction assembles all cooperative relationships.” To hear more about what Abraham has to say about the vortex check out this video on You Tube. Experiencing the energy of the vortex here has definitely had a powerful effect on me. I do believe, however, that we all have the capability to tap into the energy of the vortex no matter where we are as long as we know we are one with the energy of the vortex. Here’s a simple meditation you can do to unite with its energy. If you can do this outside in nature, I highly recommend it. Sit quietly with your eyes closed. Take three deep breaths and allow your body to relax. Feel the energy of whatever you are sitting on beneath you. Begin to see it as energy rather than the physical object it once was. Now begin to see yourself, your body, as a form of energy. Feel how you become one with the energy of the ground beneath you. In front of you see a mass of spiraling energy. Call that energy towards you and feel yourself enter the center. See your energy uniting with the spiraling energy. You are now the energy of the vortex. Feel the love that energy has for itself and for you. It’s powerful, it’s unconditional. Express your gratitude to the energy for all that it is, all that you are. If you’d like say a prayer, mantra, affirmation or ask it for something you’d like to bring in or dissolve from your life. Now sit with the energy so you can share yourself with it, like you would if you were spending time with a loved one. Begin to bring yourself back. Feel the ground beneath you. Feel the physical manifestation that is you. When you are ready open your eyes. This entry was tagged Abraham Hicks, affirmations, Arizona, energy, life, love, manifestation, mantra, mediation, prayer, Sedona, self help, spirituality, unconditional love, vortex. Bookmark the permalink. Reblogged this on Red Rock Crossing. I love your blog Melanie. It’s very inspirational. You are an excellent writer. I look forward to it. It fits right into my own spiritual journey I have been on this past year.